Thanks for being a part of the community celebration of children’s art! We want this to be a terrific experience for everyone. Here are some ideas on how to make that happen. 1. You must register and submit payment by March 6! Fill out the Registration Form below or download the PDF version here. You can pay your registration fees online or mail a check in with your form. 2. Please keep in mind how many pieces of art work you plan to hang. Consider the square footage you will need within your venue (usually 1’x1’/piece of art/student). 4. Check your email to see which venue you are paired with, keep in mind set up and take down dates. A list on this page will be updated regularly with pairings. If you would like a specific venue, please let us know on your registration form and we will do our best to accommodate you. It is important for you to be aware of available display space your venue has to offer and be sure your art will work in this space. Do an onsite walk-through before you confirm your business/venue partner. If you feel you need additional space (or less) please let us know as soon as possible! 5. Contact your business/venue partner to confirm your partnership, hanging and take down dates and times, and the available space. We will be collecting as much information as we can from the businesses about displaying art in their venue. 6. 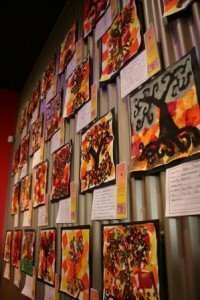 Plan your art projects for your Art Walk exhibit. This may include art projects led by AAEP teaching artists or by one or more of your teachers. 7. 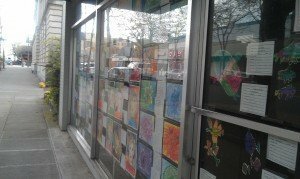 Please ‘frame’ the children’s art by gluing it to a piece of construction paper. Use the following links to download the Artist Statement Cards and the accompanying 2019 Bookmarks.Have the students fill them out and keep each student’s Artist Statement Card with their artwork so they can be displayed together. We recommend paper that is slightly heavier than regular printing paper. 8. Gather the hanging materials allowed by your business/venue. Note that schools are responsible for providing these materials. Please be sure to use only the art hanging materials your business partner has agreed can be used in their space as other materials may cause damage or require additional cleanup. 9. Gather volunteers to help hang the art on the date your business partner has agreed to, which should be between Apr 30th and May 1st. All art should be hung by noon on May 3rd. 10. We would greatly appreciate you signing up to provide refreshments or volunteer to assist during the art walk. We need facilitators at certain sites, people to distribute maps and balloons at noon on the 3rd, and refreshments for key sites. Consider asking your venue if they are interested in refreshments as well. Check back here for a link to sign up! Help us spread the word! Use the following attachments to print and pass out or post on social media, on your websites, in newsletters and more. We also have hard-copies of the posters at our downtown office that you are welcome to pick up as well! 11. Remove the display on the date you set with the business partner. We have suggested that the art be left on display through the end of May and at the very least, through May 26th to allow time for families to see the art if they miss the opening weekend. Take-down should ideally happen on May 27th and 28th. Please help us plan for next year, and take the evaluation! We will do our best to accommodate venue requests, however, we cannot guarantee you will be paired with your requested venues. There is a $35 registration fee for that includes one venue, additional venues are $10 each.